Jonathan Rea (Kawasaki) leads eventual race winner Marco Melandri (Ducati) in race one at Phillip Island in Australia on Saturday. 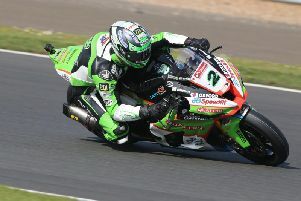 Jonathan Rea contemplated pulling out of the opening World Superbike race at Phillip Island in Australia on Saturday as the reigning champion battled a rear tyre problem. Rea completed the race in fifth place and admitted he ‘could not make it happen’ as he finished off the rostrum for the first time since he won his record-breaking third straight title at Magny-Cours in France last October, when he was forced to retire from race two. Ducati’s Marco Melandri stormed through to clinch victory over Rea’s team-mate Tom Sykes, with Chaz Davies completing the podium on the second of the Aruba.it Ducati machines. Rea, who had won the previous four races at Phillip Island, said: “I had a blister in the rear tyre from around lap 16 which was really unfortunate because until that point I felt quite good with the bike. “It is a double edged sword because, of course, the tyre did not stand up to the job and the way I was riding, but also the way I have been riding is not 100% natural right now. I am still trying to find a good way. We have been changing the bike quite a lot to feel really comfortable. “We could not make it happen. The vibrations were that much that I kept thinking I was going to crash, like Donington,” added Rea, who dropped from second place to fifth. Spain’s Xavi Fores finished fourth ahead of Rea on the Barni Ducati while Eugene Laverty – who qualified second fastest in Superpole 2 – was eighth on the Milwaukee Aprilia behind Alex Lowes (Pata Yamaha) and Leon Camier (Red Bull Honda). Race two takes place at 04:00 GMT on Sunday.